Want to know what college students think about Hillary Clinton being “dead broke?” Watch this video from Campus Reform, as they dissect the meaning of dead broke. You may understand why I am likely the first political pundit to go on record saying that Hillary Clinton will not be the Democrat nominee for president in 2016. Hillary’s bump on the head has her talking like she has Tourette’s Syndrome. $140K Senate pension, a house worth $1.7 million, another worth $2.45 million, an $8 million advance on a book, and the ability to make $200,000 per speech is NOT DEAD BROKE. All Hillary had to do to make money was to SPEAK, and get $200,000! And it’s not like she had to LOOK for places to speak, as Leftist organizations were clamoring for her to come get their taxpayer-funded money. Clinton’s biggest problem at the time was figuring out how to book the private jets and limos to get her to events! It is said that Hillary Clinton has earned over $5 million dollars speaking, and that’s just in a few short years. She has made more money in a few years than most people will earn in a lifetime! I know the bar has been lowered with Barack Obama, but what Hillary said is “Joe Biden” stupid, and college kids realize it. And If Hillary is stupid enough to claim poverty under those circumstances, then she’s too stupid to be president. 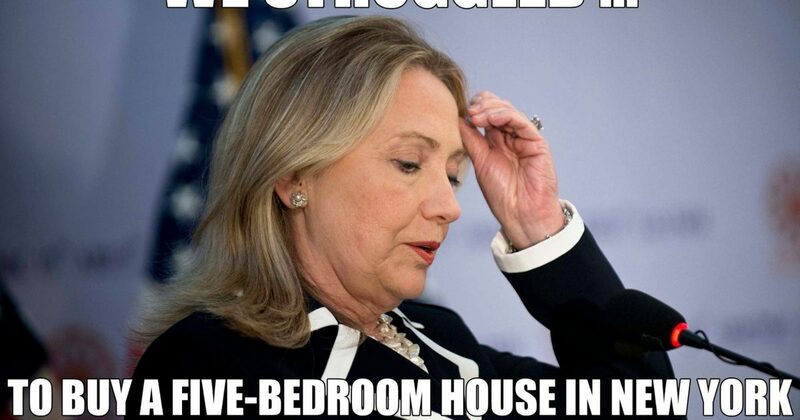 Hillary may escape Benghazi, but she won’t outlive her “dead broke” moment.